Do your business reports a high churn rate? Are you looking out for ways to reduce churn rate? Do you need a solution that gives you correct churn rate? Then you are in the right place. Churn rate simply means percentage of lost customers or lost revenue in a certain time period. It’s sad to lose hard earned revenue and customers. But you can’t ignore. However, you may get rid of freeloaders or low spenders. How much % of paying customers you are losing every month is your user churn rate. As of today, a 10% user churn rate implies, 10% of the total active paying customers you had 30 days ago have canceled within the last 30 days. How much % of the revenue you are losing every month is your revenue churn rate. As of today, a 10% revenue churn rate implies, you lost 10 % of your MRR within the last 30 days to the MRR it stood 30 days ago. Downgrades are due to customers migrating to the lower plans citing high pricing or they may be happy with the features in the lower plan. Customers cancel their subscription if the product doesn’t work properly, the customer finds a better alternative or is unhappy due to poor customer service. Be it any case, churn is bad. Based on the simplified churn rate definition at the start, we will apply the formula and see how to derive churn rate. Let’s say, as of 1st July 2018 you have total 100 paying customers and when you close the month on 31st July 2018 you observe only 95 from that customers paid you. It means you have lost 5 customers in the month of July. Now, we will calculate the churn rate for the month of July. Remember, even though the percentage of the churn rate varies from business to business, a 5% monthly churn rate equals to losing a substantial number of users in a year. Therefore it needs to be lowered. Let’s say, as of 1st July 2018 you have total 100 customers each paying you $100. So your MRR becomes $10000. At the end of the month on 31st July 2018, you observed 5 customers downgraded to the $80 plan and 5 customers canceled their subscription. This means you lost $100 (20*5) due to downgrades and $500 (100*5) due to cancellations. Now, we will calculate the churn rate for the month of July. The above example of revenue churn showed a simple calculation. But you will add customers, lose customers, see customers migrate from one plan to another frequently. Moreover, there will be a lot of free or unwanted users who may convert or leave the service. You would also have customers on annual or quarterly plans. Hence as the business grows, calculating churn rate will become a nightmare for you. So, how would you arrive at the accurate churn rate considering all cases? Putler provides a total of 15 subscription metrics including your user churn rate for Stripe, PayPal, WooCommerce and Authorize.Net. Simply connect your payment gateways, e-commerce systems and Putler will take care of all calculations and cases. However complex data your business deals with, Putler will handle that efficiently. Thousands of e-commerce and SaaS businesses rely on Putler daily to monitor and grow their business. User churn rate v/s revenue churn rate – which one to focus more? Interesting! But both user and revenue churn is equally important. If you have multiple pricing plans, focus more on the revenue churn. Losing customers is bad if you lose out on loyal ones. But if you are getting rid of free users or non-paying customers, it’s beneficial. Let’s brainstorm some quick actions that can bring your churn rate down to a great extent. If you convert more monthly subscriptions to yearly subscriptions, you will reduce your monthly churn rate to great extent. List down the behavior of your monthly users, where, how, when do they engage with your product and services. Grab their attention with their interest and provide them an irresistible offer which can make them move from monthly plan to yearly plan. Delinquency is related to credit card payment failures. There are many reasons why credit card payments fail so try and get your online payment mechanism work seamlessly. It will boost a great user experience as well which is one of the best practices for reducing the churn rate. Be it sending a welcome email to the customer or addressing any grievance, keep all channels of communication open to him. Make sure to sympathize in case of a trouble and always be courteous in the conversation. Customer service is about promptness, transparency, and action. Adhere to the timeline to get back, be transparent in policies, never hide anything from the customer and make sure to get his issue resolved ASAP with the help of teams. Often your competitor introduces better features and service before you do and this can lead your customers to switch to your competitor. Be innovative and always find out the market needs which keep changing. Observing your competitor’s move constantly can help you to be in the league. Appreciate customers’ loyalty towards you and never disappoint them. You can offer them exclusive deals, special discounts or upgrades which can motivate them to a greater extent and retain for a longer time. Create different strategies for loyal customers, for newly signed up customers and for free users if they seem to be opting out of your product. Going further, we will see average churn rates across industries and understand a short case study on Netflix’s churn rate. These would help us in reflecting on our learning on churn. There are various factors that affect the churn rate and every industry is also different in its approach in tackling the churn issue. The chart below is populated by Recurly.com where you will find that roughly 6% to 12% yearly churn rate seems normal across different industries. 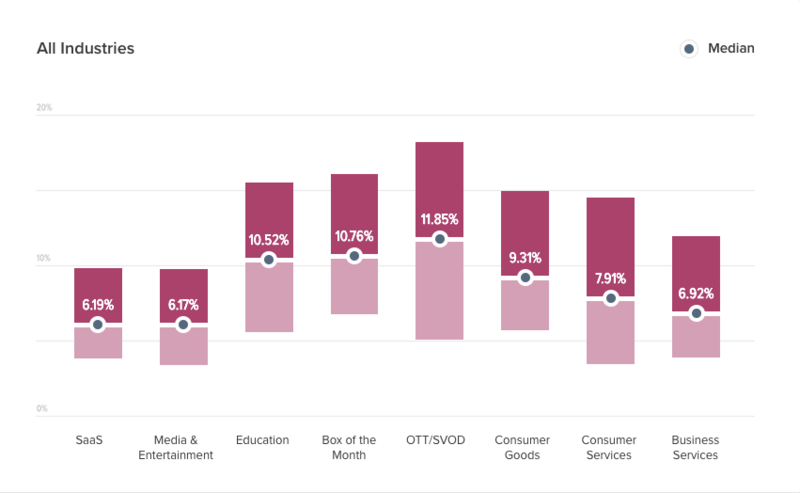 Case Study: How did Netflix manage to keep its churn rate low? Netflix captured 52% of the broadband households in the US, while Amazon Prime 24% at the end of 2015. In case of Netflix, 9% of customers canceled their subscription including those who were on trial period, while in the case of Hulu and Amazon Prime, its competitors, the churn rate was 14% and 19% respectively. The key success factor for Netflix, Hulu and Amazon Prime – Original Content. Netflix planned heavy investment in 600 hours of original, quality content in 2016. From the above data, we could easily transcend one assumption that subscribers were more loyal towards Netflix due to its high engagement in the original content and therefore it continued to invest heavily in feature films, kids show, documentaries and stand-up comedy shows. Churn is bad! You constantly need to improve your product, user experience, customer service and be active in the market. Still, there will be some who won’t like you and it is ok. You have to observe your customer’s behavior constantly and act upon it to sustain them. And to observe your customer’s behavior and keep a check on your churn rate, use Putler.